If you are not getting enough cleavage and you could usually get more cleavage from other bras, then the bra is slightly too large for you. Try a smaller size cup. How do I know if the Upbra bra will work for me? As long as you can take your hands and create cleavage with your hands easily then the bra should work for you! If the bra keeps rising up when you are moving around or when you raise your arms up and you have to constantly keep pull the bra back down, then the band of the bra is too big for you. Try a smaller size band. If the bra feels too tight and is uncomfortable or is digging into you in either the under wire area or band area, then the bra is too small for you. It can be too small in either the cup, the band or both the cup and the band. Try a larger size bra. If you are getting a muffin top or spillage of breasts over the top of the bra cup, then the cup is too small for you. Try a larger size cup. If the bra is poking out in the center when the Upbra bra is locked in for cleavage, it can mean either the following: the cup is too big, the band is too big or both the cup and the band is too big. 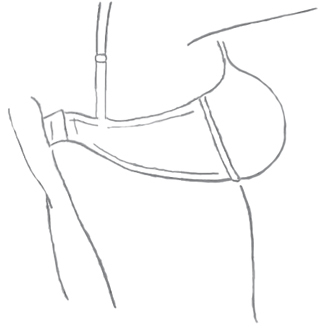 When the Upbra bra is being worn properly, there should be no spacing within the cups; the back band should be at the loosest hook but feel snug. That way, when the bra stretches out after a long time of wearing, you are able to hook it in tighter. In addition to this, when the cleavage control straps are activated they should be hooked in at most half way to attain the cleavage and lift desired. It if is being hooked past the middle then it means the size you currently have is too big and will cause the center to poke out. If you get a gap or space at the top of the cup in between your breast and the cup or your breast does not completely fill out the cup, then the cup of the bra is too big. Try a smaller cup.